With classes over for the year, I have been able to devote more time to work on the torpedo. Here are some views of the current state of the torpedo. As you can see, compared to the May 7 photos, progress has been made in several areas. The seat section has been reattached to the body platform for the final time (I hope) and the doors are now on. 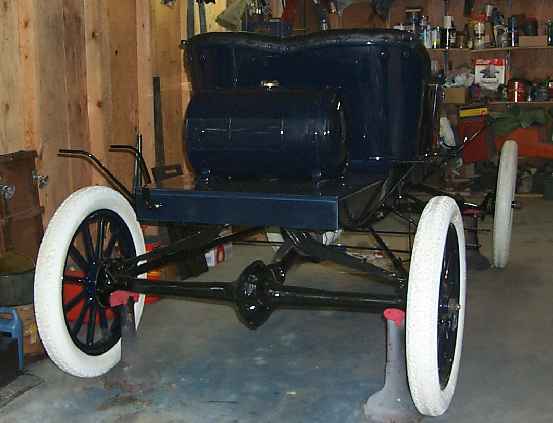 You will also note that the wheels have been painted and are on as well. The wheels came out well. I used Featherfill as the primer on the wood, sanded with 150, then 220 and finally 320 before giving it a coat of Dupont Veraseal sealer, then two coats of Dupont Centari with gloss additive. Painting wheels is always a bit tricky. I paint them mounted on a pair of old axles I keep around for just that purpose. It allows me to spind the wheels while painting. The trick is not getting too much paint in the center when using a back and forth sweeping pattern on the spokes. The other addvantage to having the wheels on the axles is that I can continue to rotate them as the paint sets up, so if I see a goober starting to form, I can rotate the wheel 180 degrees and let the paint smooth out again. The final results are quite pleasing. The gas tank is mounted. 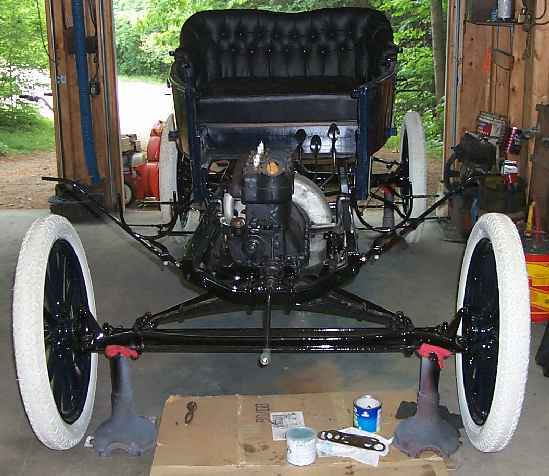 The body, fenders and gas tank were painted last year, so the paint has had about 10 months to cure. There were a couple of small goobers in the tank, but I was able to remove them by first using a small vixen paint run file, then wet sanding with 400, 600 and 1200. Power buffing left a nice smooth finish. 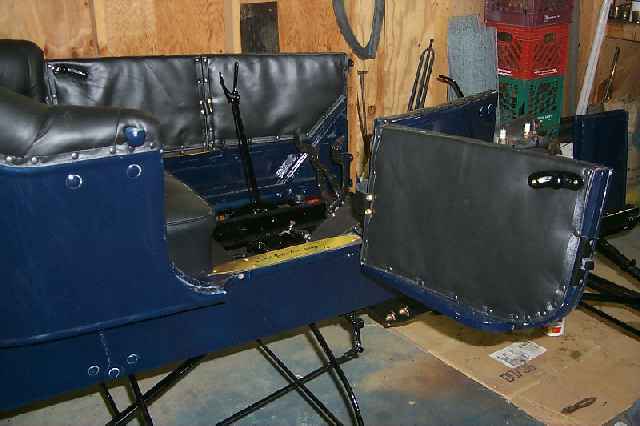 The most recent challenge has been putting in the seat upholstery. The upholstery kit came from Carter's. Kit is the operative word. 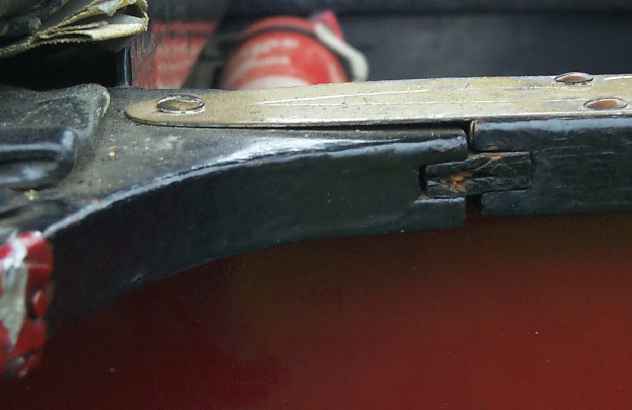 The seat bottom was installed by Carter's and that came out fine, except that they chose to attach the covering to a sheet of plywood rather than the springs, consequently the seat does not fit over the square nuts that hold the front top irons to the seat frame. The back was another story. The pleats were stuffed with cotton batting and looked very lumpy. Nothing seemed to fit well. I ended up taking the seat back apart, and rebuilding the stuffing with foam and poly fill and now the pleats look something like what they should. The final product is adequate. If I had it to do over again, I would probably go a different route. 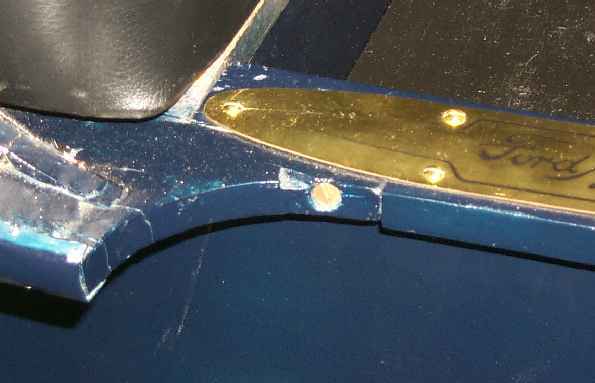 Seems like there ought to be a trim piece just at the front of the bottom edge of the seat. 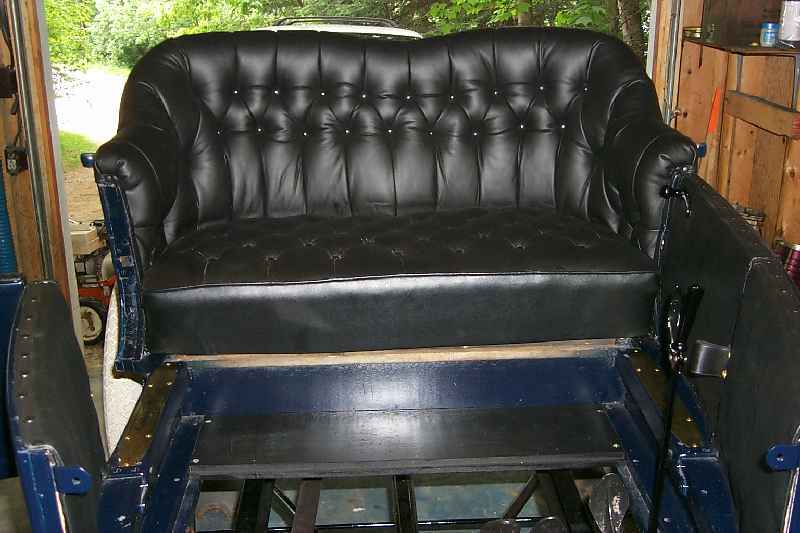 My pictures of orginal torpedo upholstery don't show clearly what should be there and there are few tack holes or other clues to what it originally looked like. 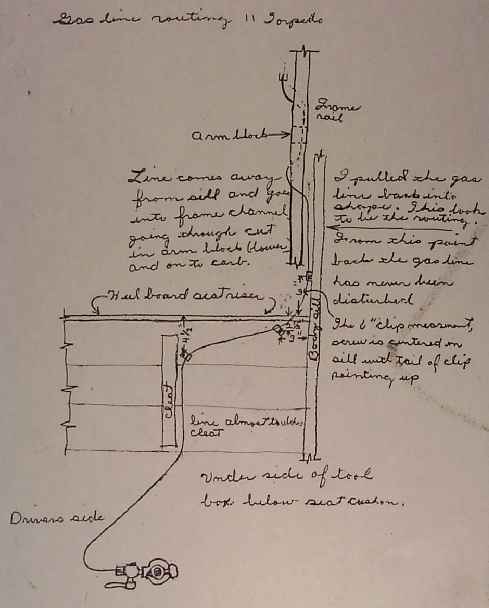 The panel pocket is not original, but the area ahead of it and the door are original. The top edges are not square as if the leather was streched directly over the wood, but appear soft and rounded. So this is the look I was striving for. Word of advice: next time you're restoring an early brass era car find an untouched original in excellent condition that was built the day before and by the same body manufacturer as the car you are restoring. 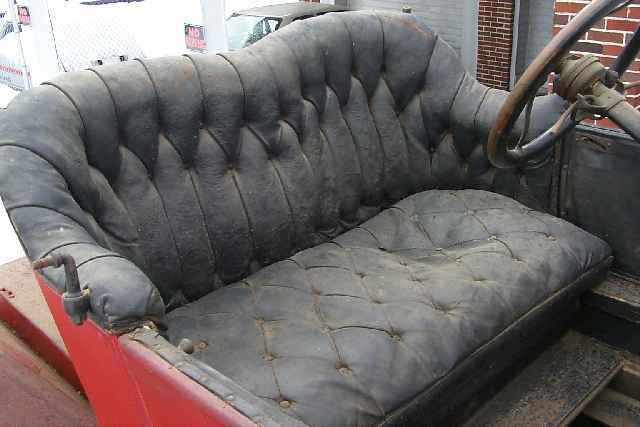 89 years later this seat still looks good. I have learned that there are some differences in the construction of torpedo bodies by the different body manufactures. This car was built by the C.R. Wilson Body Company. 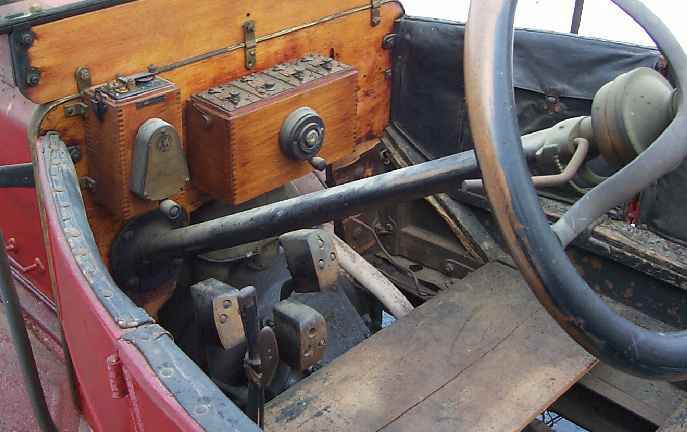 Note how the seat merges into the bottom and is attached to the sill by a flat head wood screw. 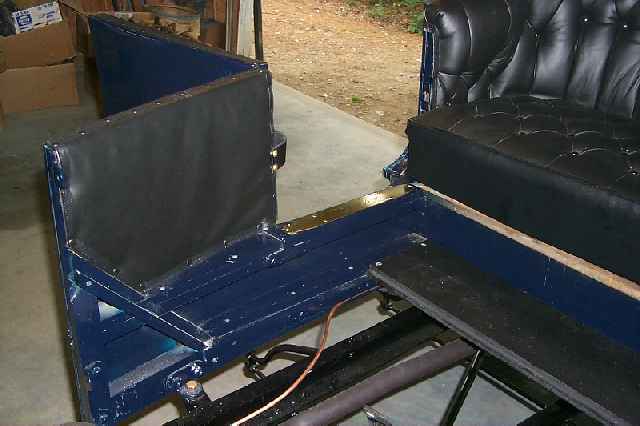 On this car the seat section is attached to the door jam by a wood "biscuit". Diminsionally the two systems are the same, but the technique of construction is different. 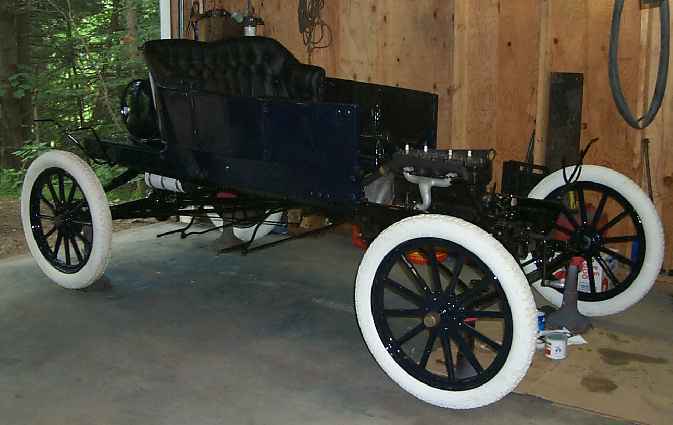 I do not know the body manufacturer of this car - we were unable to find the body number on the front edge of the seat frame so it could be either a Beaudette or Hayes. The three little clips Steve shows are Ford Factory Number T-1395 Gas Line Clips (3 used on enclosed and open runabouts, 1911). The drawing survives and making the clips took about an hour.